When you want to deploy a PHP application that you wrote, you can first deploy it on a Raspberry Pi. Once your PHP application gets enough traction, you can then port it over to a computer with more horsepower. When your PHP application employs MySQL or MariaDB as the backing database, we can put it up on a LEMP stack. In this situation, HTTP requests will first be directed to the Nginx reverse proxy server. Whenever the request is made to a php application, Nginx will then pass it on to the PHP7 Fast CGI Process Manager (PHP FPM) for generating the HTTP response. 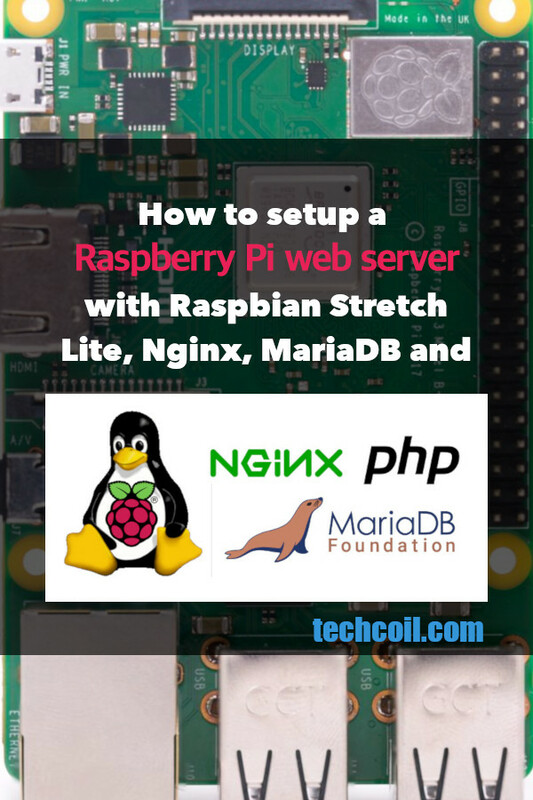 Given these points, this post provides the steps to setup a Raspberry Pi web server with Raspbian Stretch Lite, Nginx, MariaDB and PHP as the LEMP stack. What do you need to setup a Raspberry Pi web server on a LEMP stack? Before we dive into the details, let us look at what we need to setup a Raspberry Pi web server on a LEMP stack. A domain name and the corresponding DNS / DDNS configurations to direct HTTP requests to our Raspberry Pi. The Raspberry Pi hardware for your Raspberry Pi web server. A copy of Raspbian Stretch Lite installed on a microSD card. A copy of Certbot to help acquire artefacts to enable browser-trusted HTTPS communication. Before a user sees your website, he/she will type a domain name on a browser. Given that domain name, the browser then uses the Domain Name System to get an IP address. Once the browser has the IP address, it then sends HTTP requests to your HTTP server and build the web page based on the HTTP responses from the server. In case you are getting a domain name for your web server on the Internet, you can consider Namecheap. So why do I recommend Namecheap for hosting a Raspberry Pi Web server at home? This is because, you can get your Raspberry Pi to use Namecheap dynamic DNS to update your domain when your home’s public IP address changes. When your Raspberry Pi sits behind a router, you will also need to forward port 80 and port 443 of your router to your Raspberry Pi. In case you need a reference, you can follow the tutorial on how to forward port 80 and port 443 on Linksys EA7500 Max-Stream AC1900 router. Once you had gathered all the necessary hardware, proceed to setup Raspbian Stretch Lite with SSH server enabled on your microSD card. Given that, you will be able to SSH into your Raspbian Stretch Lite to perform further configurations when your Raspberry Pi is connected to your router via a network cable. So, what if you wish to connect your Raspberry Pi to your router over WiFi? In such a case, proceed to setup Raspbian Stretch Lite with remote configuration over WiFi on first boot. Given that, you will be able to SSH into your Raspbian Stretch Lite to perform further configurations when your Raspberry Pi is connected to your router via WiFi. Next, remove the microSD card from your SD card reader and insert it to the microSD card slot on the Raspberry Pi 3 board. After that, proceed to assemble the Raspberry Pi 3 board to the Official Raspberry Pi case. With the assembly of your Raspberry Pi 3 board and Official Raspberry Pi case, connect one end of the RJ45 cable to the RJ45 port on your Raspberry Pi 3 board and the other end of the cable to one of the switch port of my home router. After that, I connected my micro USB cable and supply power to my Raspberry Pi 3 board. There are a few configurations that we should perform on the first run of our Raspbian Stretch Lite. Therefore, proceed to change the default password, Locale and Timezone of Raspbian Stretch Lite. Mar 19 07:25:05 raspberrypi systemd: Started A high performance web server and a reverse proxy server. This installation of mariadb-server will not prompt you for a root password. This is because the root user was by default set to use the unix_socket plugin, which allows the user to use operating system credentials when connecting to MariaDB via Unix socket. After you had ran the above command, you will be presented with an interface to interact with database server. In order to use Let's Encrypt facilities, we will need a ACME client to help us get the SSL artefacts from Let's Encrypt. Therefore, you will need to install Certbot on Raspbian Stretch Lite for obtaining Let’s Encrypt’s browser-trusted certificates. After you had installed Certbot, you can then used it to get the SSL artefacts onto your Raspberry Pi web server. Create a database user with privileges to interact with a database instance. Create database tables and execute any other SQL queries for your PHP application. When you have a PHP application that does the database initialization for you, you may skip this step. For example, in the post on setting up WordPress on Raspberry Pi 3, only a database user and a database instance was created for WordPress. Configure Nginx to proxy HTTP requests for dynamic content over to PHP FPM server. Configure Nginx to serve HTTP requests for static content. Use Certbot to acquire SSL artefacts for Nginx to serve HTTPS traffic with a browser trusted certificate. Configure Nginx to serve HTTPS traffic. Configure Nginx to redirect HTTP traffic to HTTPS traffic. Since it is a good practice to use a separate database user to interact with your database instance, you should proceed to do so. After you had ran the above commands, your PHP application will then be able to use anewuser with password as the password to interact with the database instance phpAppDb. In case you need to perform more database administration on your MariaDB database instance, you can refer to MariaDB's knowledge base for the list of SQL commands that you can run within the mariadb interactive session. When you want to setup a PHP application with data from another server, this is how you can migrate your MySQL / MariaDB database with mysqldump, tar and scp over to your Raspberry Pi web server. Since you now have a LEMP stack, you can also setup phpMyAdmin to help you administer MariaDB on your Raspberry Pi web server. After you had setup phpMyAdmin, you will get an intuitive web interface for creating the necessary database artefacts that your PHP application needs. 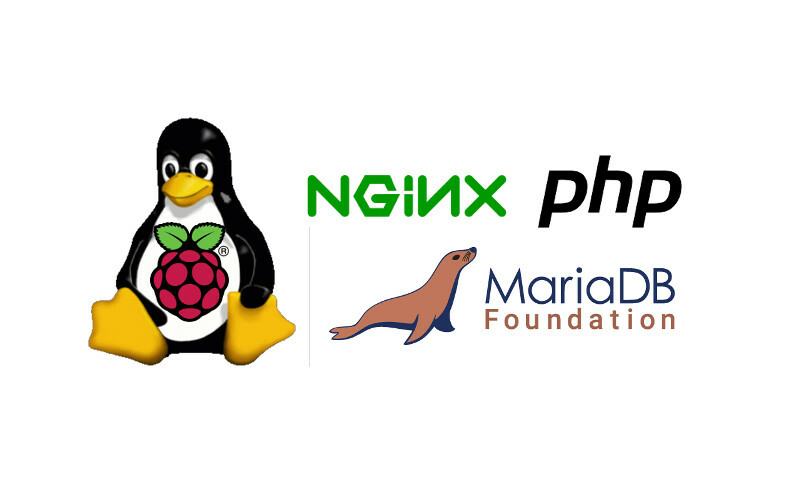 Once you had prepared MariaDB for your PHP application, the next step will be to configure Nginx to serve your PHP application. If you had gone through the guide to setup phpMyAdmin on your Raspberry Pi web server, you will get the gist of configuring Nginx to serve your PHP application. In addition to that, we typically save the above content as a .conf file inside the /etc/nginx/sites-enabled directory on your Raspberry Pi web server. Since we could have multiple .conf files on our Raspberry Pi web server, name the files with the domain name of the website for easy identification. For example, we can name the above configuration file as yourdomain.com.conf to label it as the configurations for serving content for yourdomain.com. So what does this set of Nginx configurations do? First, the server block contains the instructions for Nginx to serve HTTP traffic for a website. With the listen directive, Nginx will listen for data at port 80. Given that the data is a valid HTTP request that has a HTTP Host header that matches what is defined with the server_name directive and/or listen directive, Nginx will handle the HTTP request according to the rules defined in this server block. The root directive tells Nginx to look inside the /var/www/yourdomain.com directory for resources to serve HTTP requests directed at yourdomain.com. The index directive tells Nginx to treat any HTTP request for a directory to be treated as a request made to a index.php file inside that directory. When a HTTP request is made with a URL ending with .php, Nginx will use the last location block to handle that request. Inside that location block, Nginx pass the request over to PHP FPM which will attempt to run the .php file within the directory specified by the root directive. Through such a configuration, your Raspberry Pi web server will be able to serve content for your dynamic website. When a HTTP request is made with a URL that does not end with .php, Nginx will use the first location block to handle that request. With the values specified in the try_files directive, Nginx will try to map the request to a file within the /var/www/yourdomain.com directory. When Nginx can find a match, it returns the content of the file as a HTTP response back to the HTTP client. In the event that there is no match, Nginx will send a request to /index.php alongside any query string variables that were included inside of the requested URL. This will in turn trigger Nginx to handle the request with the last location block. When your PHP application is not serving sensitive information, the Nginx configurations discussed so far is enough for your PHP application. In case you want to secure the communication between your Raspberry Pi web server and its client, you will need HTTPS. After you had made the changes, type Ctrl-X followed by Y to save the file. After you had restarted Nginx, Nginx will use the last location block to return content that are created inside /var/www/yourdomain.com/.well-known directory. Certbot will create random files inside that directory to proof to Let's Encrypt that it is running in the web server that is reachable by the domain that it is requesting SSL artefacts for. When the above command is successful, you will find the SSL artefacts from Let's Encrypt inside the /etc/letsencrypt/live/yourdomain.com directory. At this point in time, you will be ready to configure Nginx to serve your PHP application via HTTPS. After you had changed the contents, type Ctrl-X followed by Y to save the configuration file. After your Nginx instance had restarted successfully, it will listen for HTTP requests at port 80 and 443. When Nginx picks up a HTTP request from port 80, Nginx will use the first server block to handle the request. With the configurations inside that server block, Nginx is instructed to redirect the HTTP client to send a request using the https:// uri scheme instead. This will cause the client to send a HTTP request to Nginx via the HTTPS protocol. On the other hand, the second server block defines how Nginx should handle HTTP request directed at port 443. The set of directives from ngx_http_ssl_module configures Nginx to handle HTTPS traffic on behalf of your PHP application. Within this set of configurations, we use the ssl_certificate and ssl_certificate_key directives to point Nginx to the SSL certificate and private key that Certbot had acquired from Let's Encrypt. In addition to that we point Nginx to use ssl_dhparam directive to point Nginx to the file that we had generated openssl with for DHE ciphers. Apart from the ssl directives and value for the listen directive, the rest of the configurations is the same as before. At this point in time, we had setup a Raspberry Pi web server that can be used serve a PHP application over HTTPS. Simply change occurrences of yourdomain.com to a domain that you own. In order to use this setup for your PHP application, place the source codes inside the directory specified with the root directive. An index.php file should also be included to hold the front controller logic that will render different views based on the requested URI. Create a different MariaDB database instance and database user. Place your source codes into a different directory on the server. Replicate the steps defined in the Configuring Nginx to serve your PHP application via HTTPS section. These procedures are similar to what I had covered in how to host multiple websites from home. If you do not have the Raspberry Pi 3 hardware mentioned in this post yet, you may want to purchase them from Amazon. Simply click on the button below to add the Raspberry Pi 3 hardware to your cart. You may remove anything that you already have or replace some of the hardware with other hardware.